I worked as a Web Designer for about 5 years – creating websites, landing pages and so on. It was a good job but once I realized that I have to move further. I was more interested in working on complex design tasks, getting more responsibility. Product Designer was the closest career path for me according to my interests. It’s a universal position – you have to think about the whole product but not only UX or UI part. You start your work with thinking – how it works, what are business and users needs. 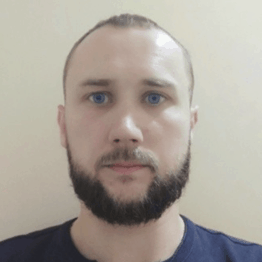 So I quit my job to concentrate on landing a Product Designer job. I researched the web to know more about the Product Designer position. Then I wrote down a list of things and skills I have to know to apply for this position. This list includes learning, preparing product portfolio, working on CV, promoting myself as a designer on the web, and preparing for job interviews. I analyzed vacancies for Product Designer to define what I have to learn, what programs I have to know. 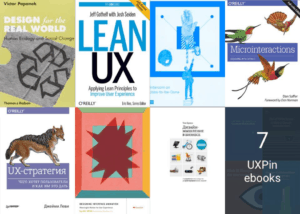 I started my path with reading articles about product design on Medium, UX Planet, Heydesigner. I subscribed to email digests by Sidebar, Intercom, Atomic Design, Medium to be in touch with design news and trends. 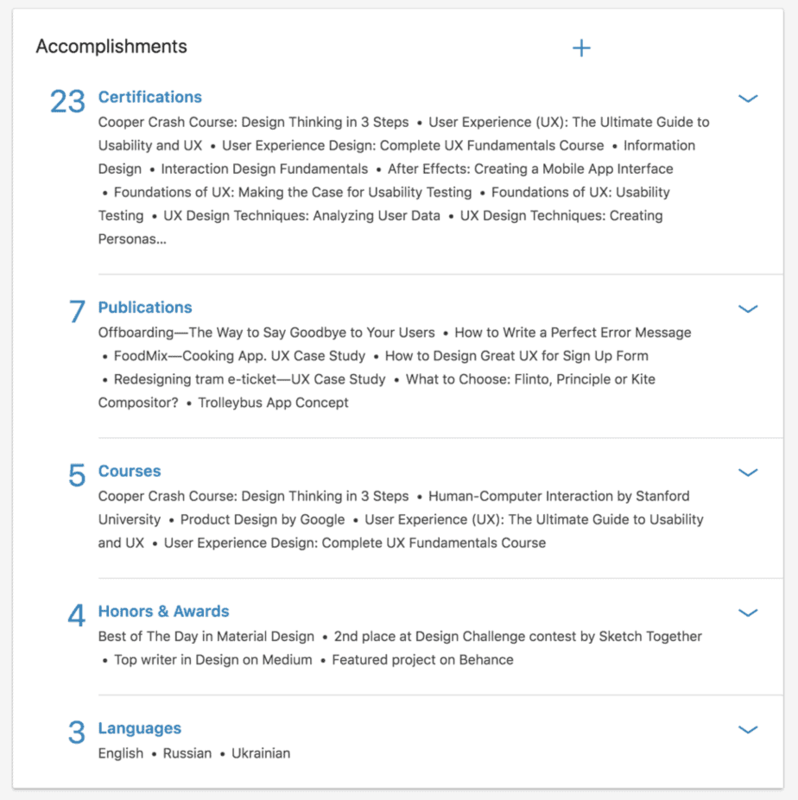 You can add certificates to your LinkedIn profile after finishing these courses. The most of the accomplishments below were achieved in 3-4 month but it changes the look of the LinkedIn page. Product Designer handles any part of the product – from email design to customer support. That’s why it’s not enough to share some nice screens or mockups. You have to show how you think and solve business and users problems. The best way to do this is to tell a story. It’s a great chance to show your design thinking and presentation skills. I used Medium platform to build my product portfolio. 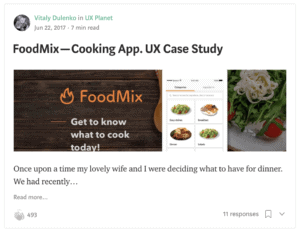 Medium is a great tool for storytelling – it’s easy to write, edit and share your stories. 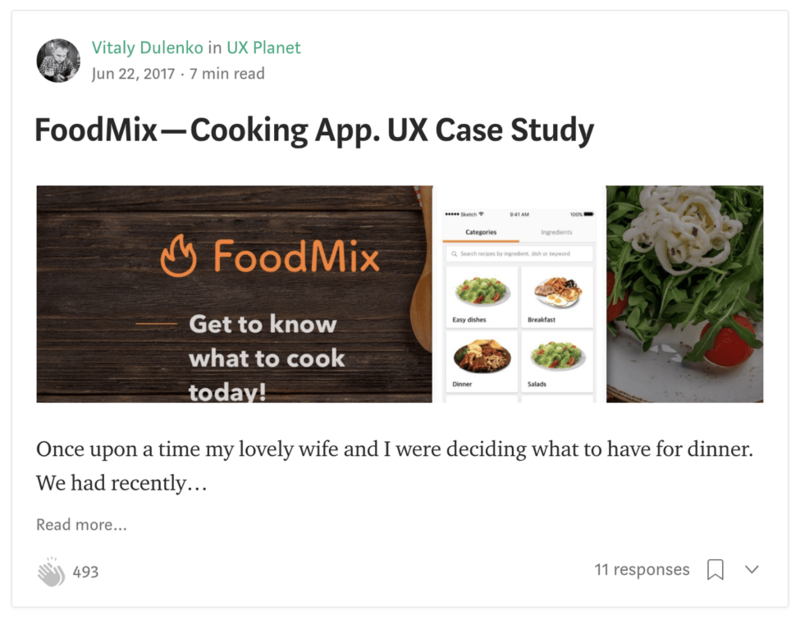 I wrote some case studies for concept apps to show my thinking process – how I defined a problem, conducted research, prototyped and tested solution. I used Behance and Dribbble as well to show my UI design skills. On Behance, I posted case studies from Medium concentrating on the visual part. I tried to post at least one shot per week on Dribbble to motivate myself and promote my works on the web. All my articles, case studies and shots I shared on my social pages – Facebook, Twitter, LinkedIn. Recruiters also use them so it’s a good way to increase your prominence and get job offers. 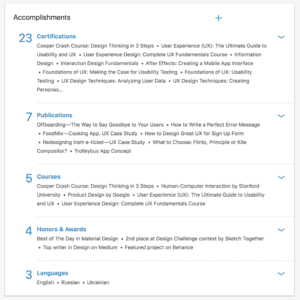 Take part in free online design challenges to get awards you can add to your LinkedIn profile. There are a lot of articles how to create a great CV so you can use them as well. Examine product vacancies requirements and build a resume with proper accents. I split all information about me into parts – Summary (1-2 sentences to describe and present yourself), Work experience (describe what you did and achieved), Education, Links to portfolio (personal website, Medium, Behance, Dribbble), Certificates (from online courses), Skills (UX design skills, programs you work with), Publications, Awards. I analyzed profiles of designers from Uber, Facebook etc to see how they present themselves. I used my CV, publications, portfolio, and awards to include them in my LinkedIn profile. Tell a short story about yourself, describe your strengths and achievements. I searched for the most common questions in design interview. Then I wrote down answers for them. I didn’t memorize these answers but they helped me to feel more confident in interviews. I prepared a short presentation for myself – who I am, what I did, what I achieved and what I’m looking for. I created a Google spreadsheet to manage my applies and interview processes. That was helpful for me to keep in touch with multiples vacancies. I analyzed my interviews to see the weaknesses and how I can improve them. The more interviews you passed, the better. You train your interview skills and become more experienced. It took me 3-4 month to learn, create portfolio and CV. As a result, I got several interesting offers and landed a Product Designer job.